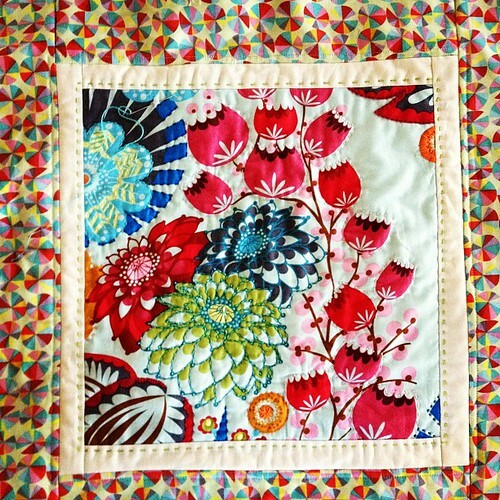 As soon as I saw Lindsey's Orbit Quilt Along I knew this would be a perfect pattern for my coveted Anna Maria Horner Little Folks voile. I got a late start to the party, but made some huge progress this weekend. I can't believe I actually finished the top this morning. Will was in my sewing room drawing pictures as I put the last two rows together. I changed the pattern up just a little by replacing some of the "background" squares with square dance panels, so all the floral motifs in the center of the five big "orbits" should have really been the background blue voile. I am really happy with it overall. A couple minor things bugging me are the fact that the center and bottom right orbit are reading as almost the same color. I thought the bottom one would look blue, but with the turquoise and yellow I guess it kind of blurs to greenish. I also wish it was a bit bigger, but considering my 33 week belly, I will probably not when I baste it today! Finally, I am a little worried about how the voile will hold up. I did generous 1/4" seams, and I know it is a more tightly woven cotton and should be stronger, but it does seem delicate and prone to fraying. But, oh, it is so soft! This is my other little work in progress. 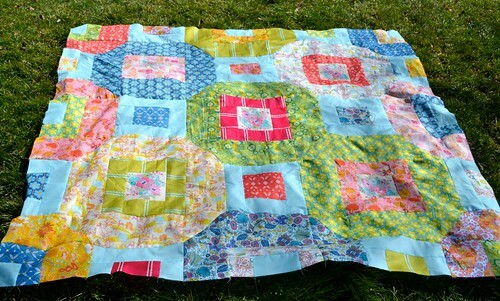 I started it at Quiltcon during Anna Maria Horner's Every Last Stitch class. I added the borders, in Kona Snow and AMH's Sundials. It is so fun to sit down with this while we watch tv at night. Just mindlessly tracing around flowers and doodling with thread and needle.